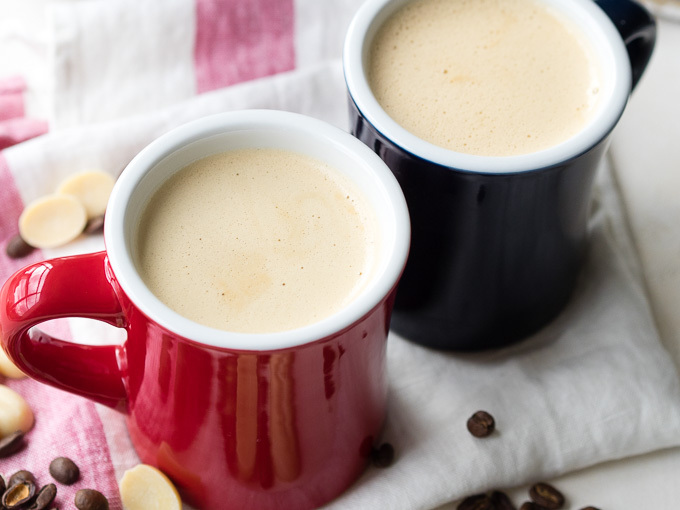 You’ll love this vegan bulletproof coffee which tastes better than the real thing! 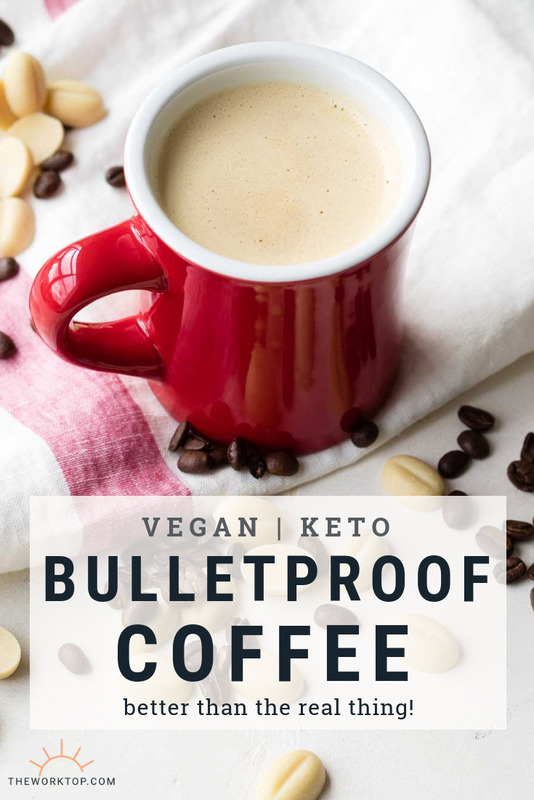 This keto bullet coffee recipe uses coconut oil, cacao butter, and almond butter for a rich and creamy drink. 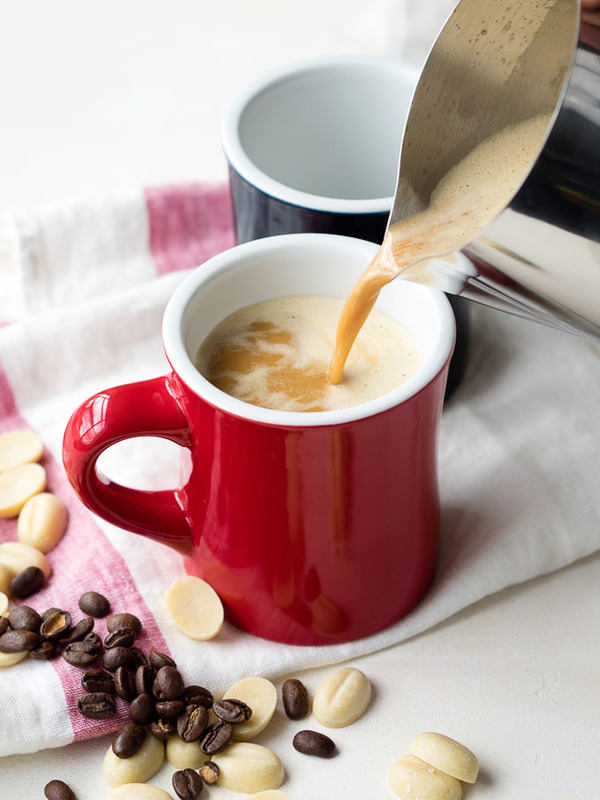 It only takes a few minutes to make this homemade bulletproof coffee. 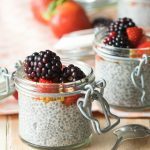 While traditional bulletproof coffee is made by combining coffee, grass-fed butter, and MCT oil, this recipe is a vegan version. And I have to tell you, it tastes so much better than the original thing. I’ve developed this recipe so it doesn’t use any butter. Instead, I’ve replaced it with an ingredient that is tastier, creamier and richer: organic raw cacao butter. Making bulletproof with cacao butter gives you a coffee that has a rich chocolate aroma. 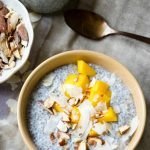 If you are new to bulletproof coffee, and unconvinced that you want to put a slab of butter in your coffee, cacao butter is a great replacement (or introduction to bulletproof coffee). Cacao butter is the the pure fat fat that is pressed out of cacao beans. 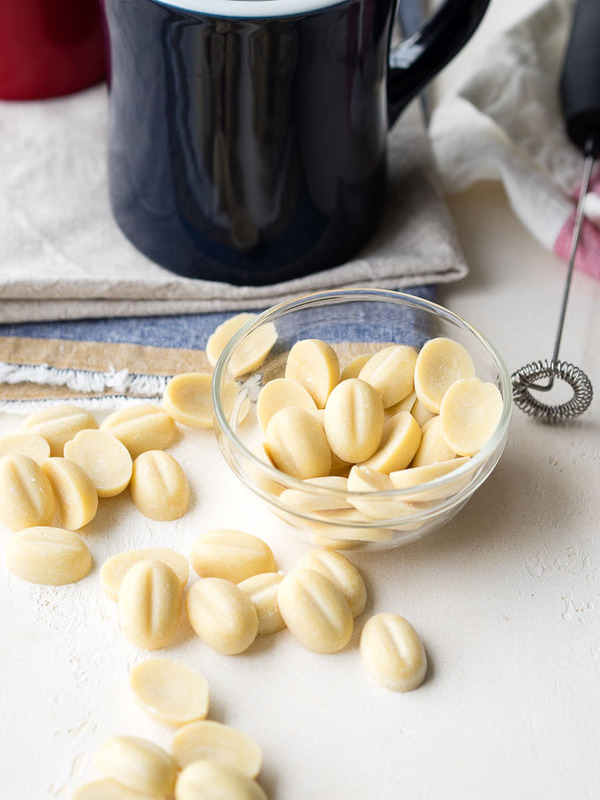 It’s the base ingredient used in white chocolate, and has the flavor and aroma of cocoa. It can be called cocoa butter or cacao butter, though often manufacturers use the term cacao butter to mean that it’s raw and unprocessed (as opposed to cocoa butter, which might be processed). If you can, use an organic and raw cacao butter. You can probably buy it at your local health store, but the easiest way is to get one like this one on Amazon. I don’t just use cacao butter in this bulletproof coffee recipe. I also add extra-virgin organic coconut oil and almond butter. Are you wondering if you really can put coconut oil in your coffee? Yes, you can put coconut oil in your coffee – and it’s tasty! The coconut oil is a natural source of MCTs (medium chain triglycerides), which is a form of saturated fat that can be absorbed by the body to use as energy. But before you just go dollop coconut oil in your coffee, there’s a specific way to add coconut oil to your coffee — described below, with a milk frother wand. 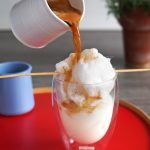 Coconut oil naturally separates from coffee, so it’s incredibly difficult to use a spoon and stir coconut oil into coffee in a way where you aren’t left with an oily layer on top of your coffee. Along with cacao butter and coconut oil, I add a spoonful of almond butter. I find that almond butter gives this vegan bulletproof coffee a bit of thickness and texture, as well as vitamin E, magnesium, fat and fiber. 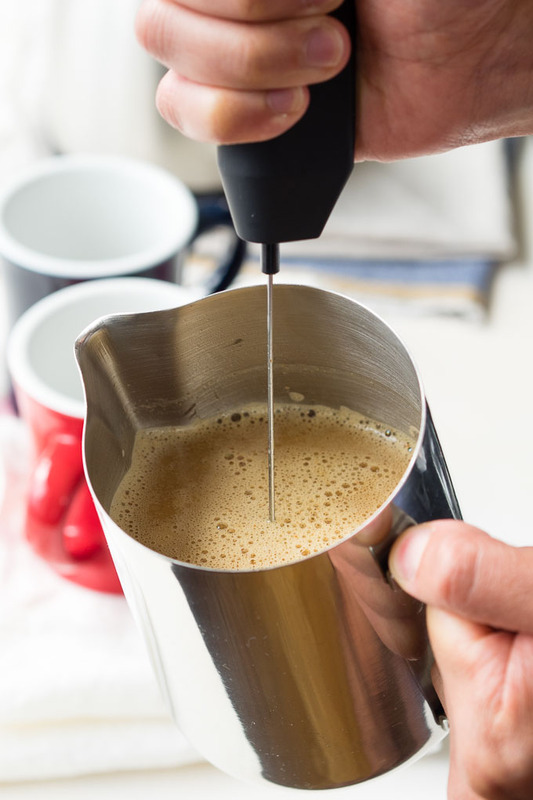 Because almond butter is a thick consistency compared to coffee, to get it properly mixed in the coffee, you’ll need the milk frother wand (or blender). The same tip about not mixing coconut oil into coffee with a spoon applies to not simply mixing almond butter into coffee with a spoon. 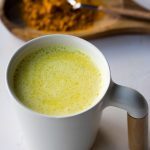 So now that you are convinced that you should try this recipe, let’s get into the nitty gritty of the post: how do you make vegan bulletproof coffee at home? It’s easy! The full recipe is below, but to make homemade bulletproof coffee, simply heat the cacao butter, coconut oil, almond butter and oat milk in the microwave until everything is melted. Add in the coffee, and whizz it with a milk frother wand until your vegan bullet coffee becomes rich and creamy. Serve and drink it immediately. Do I need a milk frother wand to make bulletproof coffee? The best way to make bulletproof coffee at home is to use a milk frother wand. Don’t have one? You can use a blender to get away with it as well. But the milk frother wand gives you so much more control when making the coffee. And you won’t end up with a bulletproof coffee that is too frothy, or too aerated. I also find it much quicker to make bulletproof coffee with a milk frother wand because it saves on the dishes. If you are making one cup, you can whizz up your bulletproof coffee directly in your mug. And the milk frother wand is so much easier to wash up than a blender. So if you plan on making bulletproof coffee at least a few times a month, I would definitely recommend buying one. 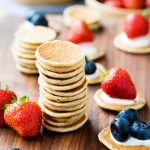 They are so small they will easily fit in your utensil drawer. Or you can buy one that has a stand. Whatever you do, don’t try to make bulletproof coffee by just stirring the ingredients together with a spoon. Oils and fats will naturally rise to the top. So if you don’t properly whizz it together with the milk frother wand, or the blender, then you end up with a mug of coffee topped with a layer of oil. You want your bulletproof coffee to look like how it does in the photo below. Nice, creamy and frothy on top. Why do I drink Bulletproof coffee? What are the Bulletproof Coffee Benefits? There’s a lot written about the benefits of bulletproof coffee so I don’t want to get into technical details. Personally, there are two reasons why I drink bulletproof coffee. The first is the energy burst. Of course we all get energy from caffeine. But with bulletproof coffee, I avoid the jitters that sometimes follows having caffeine on an empty stomach in the morning. This is especially true if I’m on the go and don’t have time for a full breakfast. Which leads me to the second reason why I drink bulletproof coffee. Bullet coffee keeps me full for a long time! The fats in the coffee keeps me going on busy mornings. If you google long enough, you’ll find posts about the negatives of drinking bulletproof coffee. 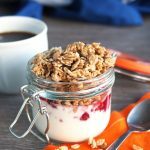 Mainly, that it’s packed with unhealthy amounts of saturated fat, and if you drink it as a meal replacement, you are losing out on other valuable nutrients and minerals you would get from a proper breakfast. I always advocate for a wholesome breakfast. But this vegan bulletproof coffee is a miracle for those go-go-go days. I pop it into my travel mug and off I skip. 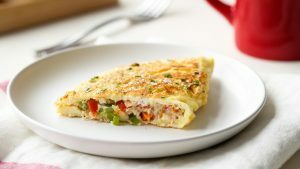 But you should always talk to a nutritionist if you are making a big change in your diet, such as having bulletproof coffee on a daily basis or switching to the keto diet. 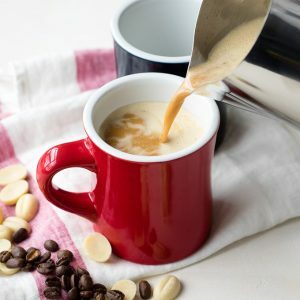 If you are following a keto diet, this bulletproof coffee is keto. Per cup of this vegan bulletproof coffee, there is 1 cup of coffee, 1/2 ounce of cacao butter, 1 tablespoon of extra-virgin organic coconut oil, 1 tablespoon of almond butter and 2 tablespoons of oat milk. 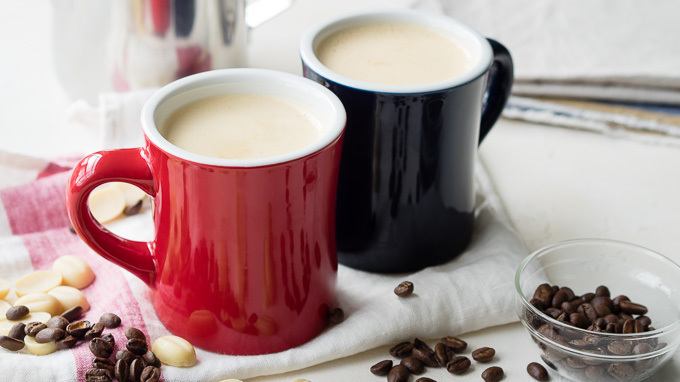 You'll love this vegan bulletproof coffee which tastes better than the real thing! This keto bullet coffee recipe uses coconut oil, cacao butter, and almond butter for a rich and creamy drink. It only takes a few minutes to make this homemade bulletproof coffee. In a large jug, heat the cocoa butter, coconut oil and almond butter in the microwave until melted, about 20 seconds. Stir in the oat milk and gently heat until warm, about 30 more seconds. Add in the coffee and blend everything together with a handheld milk frother or a small blender until creamy. Pour into 2 mugs and serve immediately. Since cocoa butter is sold differently and vary in size, if you don't have a scale, envision it being 2 tablespoons when melted. 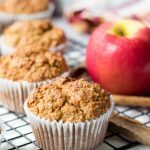 Love this vegan bullet coffee recipe? 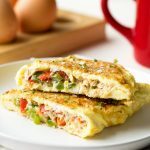 Looking for more keto breakfast recipes? Hi, do you have the rest of the Fat, Carbs/Net, and Protein for this drink? 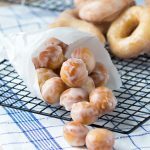 Have you tried making this in advance like a fat bomb? Just wondering if this might be a portable option that wouldnt need refrigeration?? Hi Lyn, yes I have, but not this exact recipe. I think you’ll need more cocoa butter, and less coconut oil. 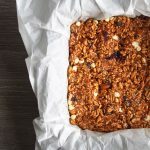 I can’t remember at the moment, but will add it to the list of recipes to post!